Todd Lyght moved to Flint as a freshman in high school when his father, William Lyght, became Flint’s police chief. Lyght attended Flint Powers High School where he was a standout defensive back and wide receiver on the football field. Todd earned All-state and All-American honors his senior season. That season as a receiver, he caught 34 passes for 887 yards and 11 touchdowns, while at defensive back, he intercepted 10 passes. After being heavily recruited by both Michigan and Michigan State Lyght’s path led him to South Bend, Indiana where he played the position of cornerback for the University of Notre Dame football team from 1987-1990. In college Lyght had a career total of 161 tackles, 11 interceptions and over 20 pass breakups. Lyght played in four major bowl games while at Notre Dame; the Cotton Bowl, Fiesta Bowl and twice in the Orange Bowl. Todd Lyght was also a two-time consensus All-American while at Notre Dame and helped the Fighting Irish win a National Championship in his sophomore season. In his senior season his teammates voted for him to be a team captain for the Notre Dame Fighting Irish football team. Lyght’s career and hard work at Notre Dame led him to the National Football League where he was selected 5th overall by the Los Angeles Rams in the 1991 NFL Draft. In the NFL he was a three-time All-Pro player and was named to the Pro Bowl team at the cornerback position. 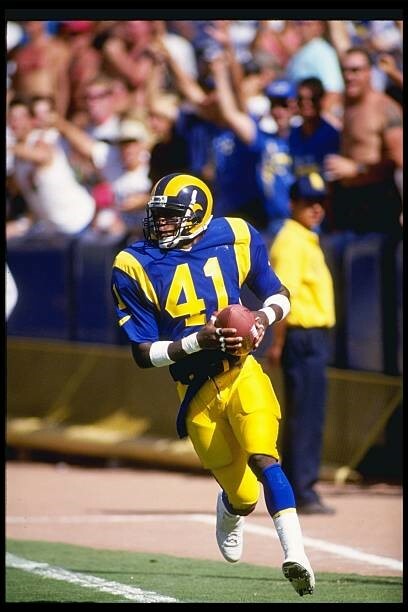 In his ninth season Todd Lyght helped the Rams become Super Bowl champions. Lyght blocked a field goal early in the game as the Rams went on to beat the Tennessee Titans to become Super Bowl 34 champions. Todd Lyght played his 12-year NFL career with the L.A./St. Louis Rams and the Detroit Lions. He had a career total of 718 combined tackles, 37 interceptions and four interceptions returned for touchdowns in the NFL. After winning a National Championship in college and a Super Bowl in the NFL Todd Lyght became a football coach in 2009 and has been helping players on and off the field ever since. In 2015 he returned to Notre Dame to become the defensive backs coach and in the 2018 he helped Notre Dame reach the College Football Playoffs. Todd Lyght you are the true definition of being “Flint Strong”! You have made Flint proud. Welcome to the Greater Flint African American Sports Hall of Fame!